Denison “Denny” Bollay is one of the guys at ExperTelligence that crafted the first Interface Builder (IB) and showed Steve Jobs and Bill Gates. Jeff Wishnie introduced me (thanks dude) recently, and I’ve been talking to Denny as I have an agenda - Pseudo-declarative UIs - that is in complete opposition to my patronage of AngularJS, but still UI markup related. As part of that agenda I’ve been trying to get to the bottom of a rumored version of Interface Builder (IB) that loaded and saved a Lisp ‘source’. I heard about this thing in the 90’s (can’t remember who told me) and I’ve been asking around about it ever since. ThoughtWorks has a number of Apple/NeXT alumni and coders active for 20+ years in the Mac space, so I’ve been able to explore more avenues. Denny wrote “Action!” that was sold by Texas Instruments after his involvement with the precursor Lisp Interface Builder in 1986. Read on..
Denny has sorted through boxes in his garage looking for it, and I think it is a fun quarter of an hour for all. This Texas Instruments video runs through the rationale for the genus of tool, then a demonstration of its use, a quicker list of features, and lastly some selling points. ExperTelligence introduced IB in 1986. We took it up to neXt to show Steve Jobs - the rest is history. In 1988, Denison Bollay built a much more dynamic interface tool, in which the interface was fully modifiable AS the program was running. Since it was built in incrementally compiled LISP, all other functions and methods were also modifiable on the fly. Denny took it to Seattle to show Bill Gates, but MicroSoft wanted a version written in basic (no objects, no methods, etc back then). I explained one couldn’t do that without OO. They built Visual Basic. Sadly, it seems no one has duplicated Action!’s sophistication and interactivity even today, 25 years later! Denny, Gray Clossman and (after relocation from France) JMH were all at ExperTelligence together and working on that IB. There was an intention to license Interface Builder as they had it, to NeXT. JMH going to NeXT and starting over on the same product was the end of that strategy. One of the realities of Californian IP law, much like Europe is that the ideas in your head, and your ability to rewrite something from concept, isn’t restrainable by your current/previous employer. 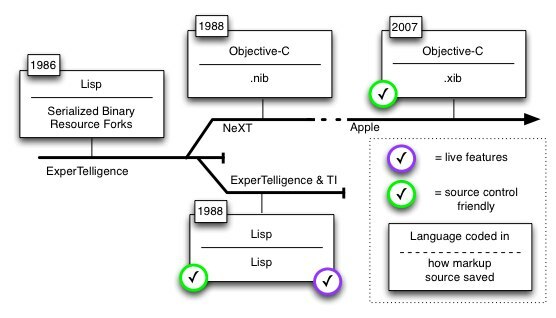 The ExperTelligence team showed the first ExperLisp version of IB to Steve Jobs. Jobs was initially not sure whether the technology was an advance over HyperCard (also unreleased at that stage). Thirty minutes later, Jobs was a convert. Bill Gates was also shown (as mentioned) and Denny actually did that demo. This initial version of IB saved “resource forks” in binary in a Mac specified format. There’s a possibility that there was some brittleness to that over time, if library/framework/package/OS upgrades were considered. Binary was not inspectable or editable outside the IB toolchain. The first shipping version of IB from NeXT saved in .nib format. Some yeas later Apple changes this to .xib which is what we have today. The latter is human readable, source-control compatible, and if you’re insane - editable outside of the IB application. Denny’s Action! saved in Lisp, and interpreted the same on load of the project. That was not just at design-time, but at runtime too. That was interpretation into a context, and a far cry from the parsing of XML, HTML, and XAML today. This Action! derivative was made outside Apple/NeXT, and in conjunction with Texas Instruments. I can’t help but feel that Lisp is a better markup language that any of (chronological order) ‘serialized binary resource forks’, plists (.nib), XML (.xib), or even today’s HTML. What’s not shown in the video is the markup code outside of the design tool. Specifically that Lisp DSL that could be round-trip edited in Vi/Emacs etc. Given this was a hopefully pretty-printed format of Lisp, I’ll claim it was source-control compatible from the outset. I hope Denny finds some example source and discusses it some more. To me, Action! is one the “holy grail” items from the history of user interfaces, if not Information Technology more generally. Tim Berners-Lee, off in switzerland, used the NeXT version of Interface Builder to design the first web browser called WorldWideWeb initially, but later renamed to ‘Nexus’, before itself being obsoleted by Mosaic. A lot of the language of the video is the same as the language of the modern Agile community, which I find interesting too. In a follow up, I’ll go into that.